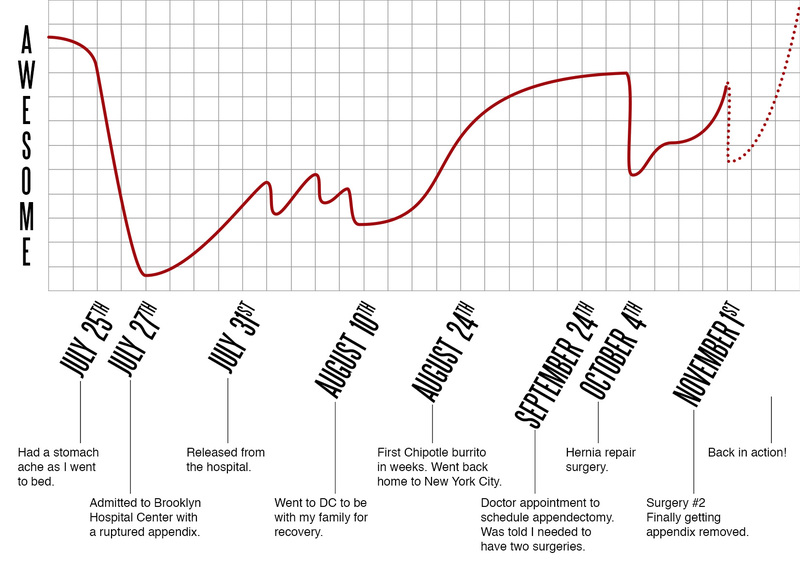 What began as a normal day in late July quickly turned into one of the roughest seasons of my life. I had no idea I would still be dealing with it three months later, but at last the end is in sight. Tomorrow, November 1st, I’m finally getting my appendix removed, so I can close this chapter for good and get on with life. It’s frightening to realize how few of our thoughts and feelings we remember from day to day. That’s exactly why I’ve carried a journal with me every day since February 8, 2008. I like to think of it as a way of taking thoughts captive. 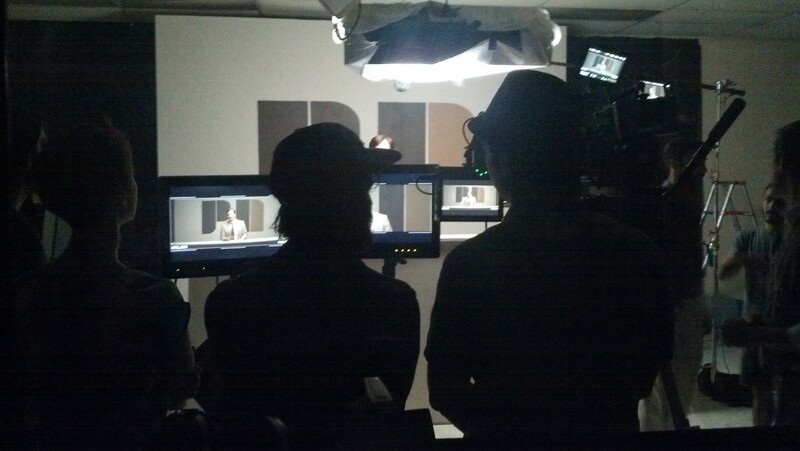 Earlier this week I had the privilege of helping on set for the film Anomaly. There is an incredible lineup of talented filmmakers involved in this project, so it was an honor for me to be a part of it. To date it’s the biggest production I’ve worked on, so there was a lot to learn. As usual I took notes in my Moleskine of the things I observed every day. Greetings, my friends! 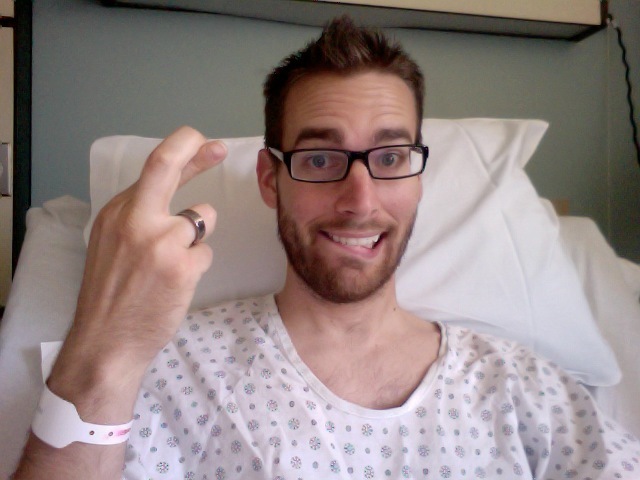 It’s been just over a month since my appendix ruptured, and I’m happy to report that I’m about 94% back to normal. Based on the number of questions I’ve been asked as I’ve eased back into society I figured it was time for another update. Let’s just say the introvert in me definitely took over for the past few weeks. After a while I got tired of repeating the story, I didn’t want attention, I didn’t have anything new to say; I just wanted to chill out and get back to normal. What I didn’t realize at the time is that recovery would take a month. I spent a solid three weeks on my back with little energy to do more than walk from room to room. By week four my back started to hurt (wonder why?…) but by then I had enough energy to walk around and get some pathetic excuse for exercise. If I knew from the start that I would be out of commission for a month it would have been easier to swallow. When you keep thinking you’ll be back in action “any day now” it starts to get a little depressing after the first two weeks. Motivation was hard to come by for a few days in there. As I expected, I progressed much faster once I got off the antibiotics. Every day I would notice a little more improvement, and even now I still feel some things rumble and bumble in my abdomen. It feels like progress, or perhaps I’m being overly sensitive to it. Until that sucker is removed I’m not going to take my chances. At this point it looks like it will be another two or three weeks before I go in for surgery to get my appendix removed. That is the most baffling part of this story for most people –“Why didn’t they operate on you immediately? !”– so I will attempt to explain it as best as I understand it. The conventional method of treating a ruptured appendix is to go immediately into surgery and get it removed. However, in recent years the medical community has begun to re-think that strategy. The problem with operating immediately is that you have a big mess to deal with. Think of it like a pest control issue. You find a bug in your house, and then another bug, and then another. The more you look the most you find, and eventually you get to the source and realize it’s a bigger problem than you thought. No longer will a can of Raid suffice, you’ve got to tear out some walls and fix the plumbing. I imagine that’s what operating on a ruptured appendix is like. You start to find infected areas of the colon and intestines and who knows what else, so those have to be removed also. What you end up with is a patient who has diarrhea for the rest of his life because the surgeon went a little overboard with the scalpel. So, you can guess how much fun that would be. The only one who benefits from that approach is the manufacturer of toilet paper. Rather than dealing with a messy surgery and unhappy patient they have started to take advantage of the fact that the infection doesn’t kill you immediately. If you think of it as an infection rather than an emergency it makes a lot more sense to attack it with drugs instead of a knife. Once the infection has been wiped out your body goes back to business as usual. In my case, it took about four weeks. That’s why the doctors decided to delay the surgery. If there isn’t a rampant infection then the surgery is much easier for them and far less damaging to me. All in all it’s a much better scenario even though it feels like a long ordeal right now. So that’s how I’ve been lately and how I’m doing now. I thank God that I’m feeling so much better, but I realize we’re not out of the woods quite yet. The best way to prevent appendicitis seems to include a diet high in fiber. Not only did I repeatedly win against Heidi, but I also whooped my dad in a game of Phase 10 during my recovery. I need to get some more travel-friendly photo gear. Schlepping my gear on the subway and Bolt Bus is no fun. Hey friends and family! This time last week I was released from the hospital. Since then I have been at home recovering, and the thought of writing another blog post has felt a tad overwhelming. Nevertheless, here’s an update on what has happened since. So last week the doctors sent me home with a week’s worth of antibiotics. ….really stinking strong ones. One of them, Levoflaxacin (or something like that) I like to call my crazy pill. It makes me dizzy while destroying every living thing in my gut. The other one is called Metropo3igpoinvpoanp. I take it three times a day, and it’s designed to kill any organisms left behind by the crazy pill. Honestly I don’t think I’m going to get better until I get off these meds. Any food I put in my body is attacked by the antibiotics, which explains why I haven’t had much energy or mental stamina these days. According to the doctors I’m “doing very well clinically,” but in practical terms I’m far from normal. As far as I understand it I still have appendicitis, and it will take a while for the inflammation to go down fully. The only difference is that the rupture and infection are under control and my body is on the road to recovery. I really haven’t had much energy since getting home, and the pain is taking its precious little time to leave. For the first few days I shut out the rest of the world as I just wanted to spend time relaxing. I was tired of repeating myself and answering questions, and I just wanted to sleep in my own bed. It was quite nice to come back to reality and find so many messages from you all saying that you were praying and thinking of us. That really means a lot! Later that day my family sent a goodie box with all kinds of stuff to help me get better. My brother and sister-in-law know a thing or two about nutrition, so it’s nice to have them (and the rest of my family) looking out for me. The weekend was just as uneventful as the days before. Pretty much all of my time has been spent lying on the couch or my La-Z-boy or our fancy new Murphy Bed. Getting up to go to the bathroom is about the most action you’ll find around here. Nevertheless, I am sooo grateful to be home rather than stuck in a hospital bed with an IV in my elbow. On Sunday night my sister and brother-in-law came up, so they could look after me while Lacey goes to school. They both work from home, so they haven’t missed a beat. It has been great having them here; just their presence is a comfort. I don’t feel like I’m missing as much in the outside world when they’re here. Yesterday I had my one-week follow-up appointment which ended up being a complete waste of time. The doctor didn’t draw blood, touch my abdomen, or even ask how I was doing. He simply looked at the same chart he looked at a week ago and said, “You’re doing well! You’ll want to schedule surgery to get your appendix removed in about 4-5 weeks.” Then he gave me another week’s worth of antibiotics and sent me on my way. To be fair, that’s apparently not abnormal treatment for a ruptured appendix, but it seems like he could’ve saved us both the trouble by simply calling instead. Nevertheless, he did give me the impression that I shouldn’t need the antibiotics after this week. I didn’t sneeze for over a week. That could’ve been painful. Final Fantasy III is available on my Android tablet. I love me a classic RPG, and this is about the best excuse I’ll ever have to sink several hours into a game like this. I’ve been reading through my Moleskine from last year. I was in Alaska during this time, so it is cool to look back and remember all the fun I had then. Even the simplest notes conjure up such vivid memories. I have a jacuzzi tub. It’s the only thing saving me from smelling like sour cheese at this point. The doctors woke me up this morning with brief, unexpected, and amazingly hopeful news. That’s right, I may be able to go home today. I’m keeping my fingers crossed, but here’s what I know for now. My white blood count is back to normal. I’ve been without a fever for well over 24 hours. The pain has subsided significantly. I still haven’t eaten anything other than ice and water, so they want to see how my stomach handles the transition before giving the final OK. It’s not a done deal yet, but things are definitely looking up! If all goes well I may be out of here sometime this evening. Your continued prayers are sure appreciated! Last night Lacey came to visit me after school. 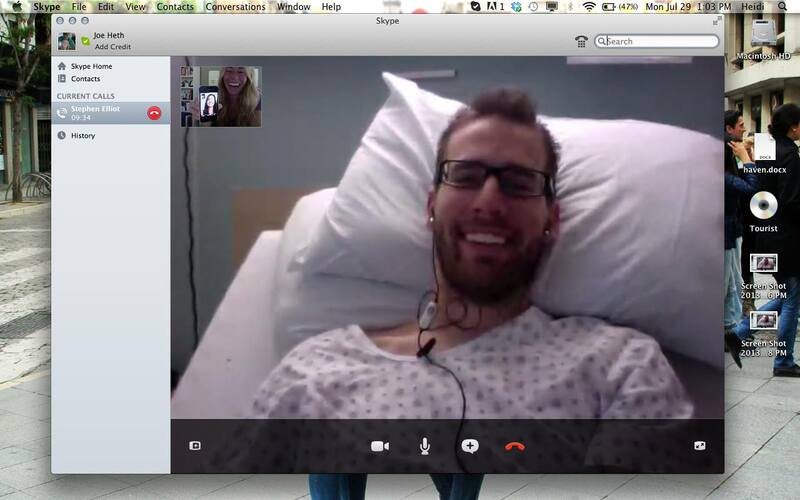 We talked for a bit and then snuggled as we watched Amelie in the hospital bed together. For a moment the busyness of the hospital seemed to slow down, no one was coming in to poke me with another needle, my IV machine wasn’t beeping, and I wasn’t in pain. In that moment, for the first time, I forgot I was in the hospital. It was exactly what I needed, to feel normal if only for a moment. Honestly I don’t feel like there’s much news to report, but here we go nonetheless. For starters, I’m feeling better, not overwhelmingly so, but I can tell it’s not as bad as it has been. Around 6:30 yesterday evening the doctors confirmed that my white blood cell count is coming down (which is a good thing), and also my fever hasn’t spiked again (another good sign). In other words the infection is going down, and the inflammation is subsiding as well. “Clinically” he said, “you are doing very well.” It was about the best news I had heard in a while. Around 7:00 this morning the doctors came in to give me an update. They didn’t say much of anything new, but they did seem more hopeful than I was expecting, so that was a relief. They did tell me that I’ll be able to have some crushed ice today! I’ve never been more excited about an unflavored snow cone in my life. They told me “If you can tolerate that we’ll progress into other liquids and foods.” What he doesn’t know is that on Sunday I was so frickin thirsty that I convinced the nurse to bring me a small cup of crushed ice. Tolerate is an understatement; I’ll handle that stuff like a boss! I got up and walked around the hospital wing for a change of scenery. Walking is still painful, but tolerable when you keep pace with the Slowskys. I’ve backed off considerably on the pain killers. 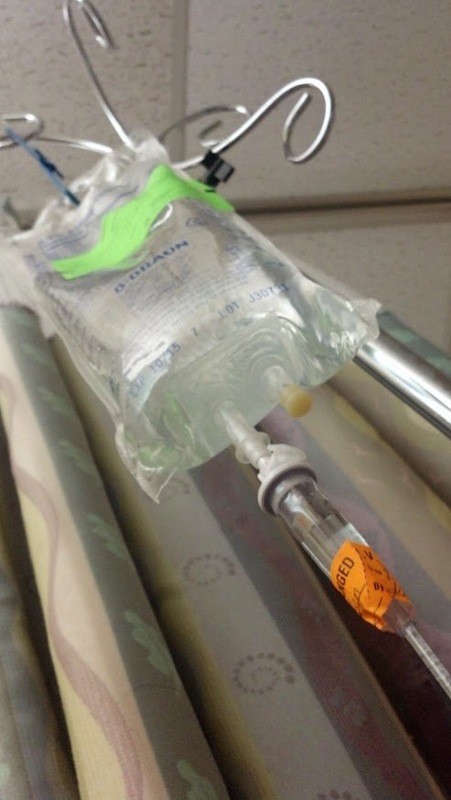 They used to give me morphine every six hours, but my last stint was 24 hours between doses. I’m glad I don’t have to rely on that stuff too much. All in all I’m slowly getting better. If I had known this was likely to be a week-long ordeal at the start I would have mentally prepared for it. Given that I’m now going on my third full day here I’m feeling more optimistic now. Who knows, I just may get up and tango with my IV hanger today. There’s a sign above my head that says “NPO” in big, bold letters. The nurses tell me is stands for “Nothing by Mouth.” What I want to know is who let the dyslexic guy come up with the acronyms around here? Apparently I have “really awesome veins.” Long story short, they needed to adjust my IV and the doctor was almost giddy when he took a look at my arm. I asked the nurse if she could put a Chipotle burrito in my IV. …still waiting. This day one year ago was the start of our hike on the Chilkoot Trail in Alaska. Oh what I would give to be there now eating beef jerky and hiking through that enchanted forest… *le sigh. If you’re just now tuning in you might consider checking out the previous post for a little more context. Last night around 1:00 AM a tall lean Russian surgeon named Eugene walked into my room and started talking. Normally it’s just nurses and PA’s that talk to me, so naturally this seemed like a bigger deal. Apparently my fever has been anything but consistent. It broke yesterday around 3:00, and then spiked to 101.something at 9:00 o’clockish. The reason Eugene came to me was because the spike in my temperature suggested that the infection might have spread to my blood stream. I’m pretty sure that’s both terrible and miserable. The good news Eugene did bring was that I am “clinically very fine.” He even hesitated wondering if he should take the blood cultures at all. After a couple minutes of talking we both decided it would be better to check it out –which requires a couple awesome needles– than assume everything’s fine. Still no word on that, but I have a feeling deep down that my blood is in good shape. I got a decent night’s rest last night. It was definitely broken, but sufficient and comfortable enough. This morning the pain in my gut has lessened, but not by much. Around 6 AM a whole army of doctors gathered around my bed to tell me the same thing I’ve heard since I first got here; we’re trying to nuke the infection with antibiotics and keep the digestive system relaxed. Any activity in my digestive system can essentially help spread the infection. Unfortunately this still means no eating or drinking anything. I finally talked the nurse into upping the dosage on my IV because I constantly feel thirsty, and I don’t think I’m getting as much fluids as I do on a typical day at home. The second reason for not having any fluids or foods is a precautionary measure. If I need to be moved into surgery then my gut is already a clean slate for them to work on. We’re gonna hope that doesn’t happen though. If they operated on me now they would not only remove the appendix, but they would remove part of the colon too because the infection is all over. Essentially this would mean a lifetime of diarrhea or frequent bowel movements. Needless to say, that’s a last resort, and it’s one option I’m not the least bit excited about. I’m staying positive, keeping a gratitude journal every day in spite of the fact that my condition is pretty much the same it was when I walked in. I can’t say I’ve gotten much better, but I don’t have any reason to believe I’ve gotten worse either. Lacey is back in school today, so I’m flying solo here at the hospital. I’ve got magazines, my laptop, several movies, and my Moleskine to keep me company. It’s no secret that I’m skeptical of the medical system in general, but things like this don’t exactly make me feel all warm and fuzzy inside. I was supposed to be in DC today for a shoot and then surprise my friend Kenny at his birthday party. Bummer I’m still here. Morphine doesn’t seem to make much difference any more. It’s quite painful to move around regardless of the pain killer. They gave me some magic socks that inflate and deflate. It’s the closest thing to a leg massage I’ll be getting around here. They are quite stylish too.